I am happy and grateful to take recent advantage of “The Bumgarner Effect.” See, a couple years back I put together the base set for 2010 Topps National Chicle. I busted a hobby box and a couple retail blasters, and amongst those packs I got a Madison Bumgarner autograph card. At the time, it was routinely selling for no more than five bucks on eBay, so I decided to just keep it and store alongside the completed base set and the various short prints I acquired during the initial pack-opening stage. I gave very little thought about it again until midway through this past World Series, when I became curious as to what was happening to the value of the card. When I saw that his World Series performance caused the card to rocket into the $35-$50 range (as recently as late September, one such card sold for just $8.50, including shipping,) I knew I needed to take advantage of the sudden bounce in value. 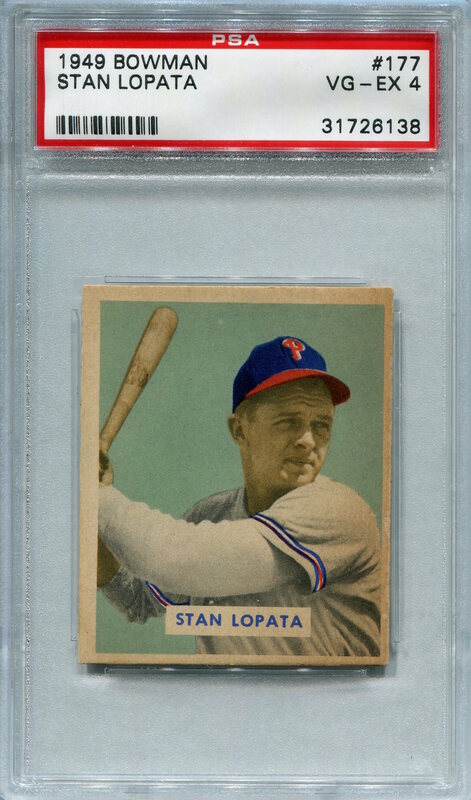 The best part: almost immediately, I was able to use the money to acquire the last card I needed to complete my 1949 Bowman team set: Stan Lopata, and I still had some cash to spare. I can’t help but feel I came out ahead on this deal. Yes, Bumgarner has crafted an amazing postseason resume, and he currently possesses the skills to assemble a Hall of Fame resume. However, the history of baseball is replete with similarly great young pitchers whose careers flamed out before compiling the stats necessary to garner enshrinement. Hell, it appears that one of Bumgarner’s own teammates, Tim Lincecum, may very well join the likes of Dwight Gooden, Bret Saberhagen, Fernando Valenzuela, Vida Blue, and Dontrelle Willis — just to name other such examples from my lifetime. Even if Bumgarner’s career eventually reaches Hall-worthy status, I’d still much rather have the Lopata card. The primary reason for this should be obvious: it’s because I’m a Phillies collector first and foremost. Beyond that, however, is the fact that cards of Lopata’s vintage are holding their value much better than newer material. 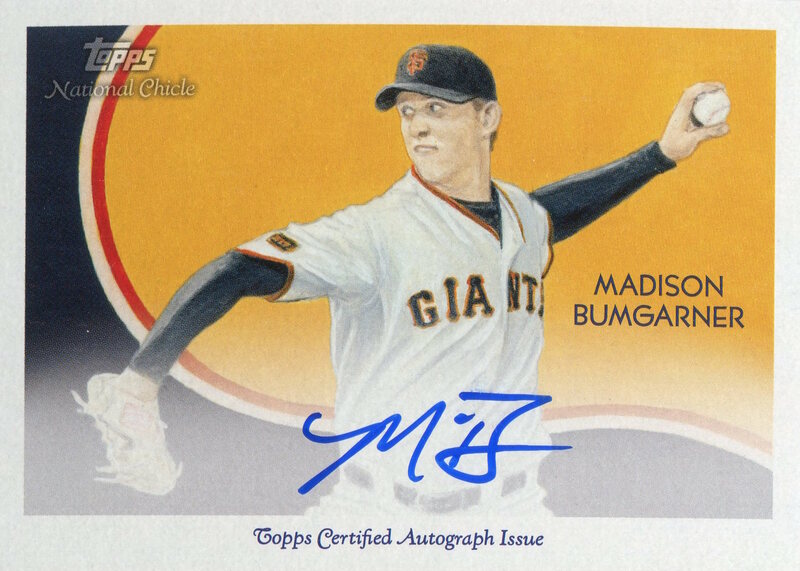 In addition, there are other Bumgarner autograph cards out there, and I suspect that plenty more will be made in the coming years. In other words, I have no doubt that I’ll face few difficulties should I ever want to reacquire a Bumgarner card at a decent price. The same cannot be said for a 1949 Bowman Stan Lopata in professionally certified in mid-grade condition. I rarely get the opportunity to sell something from a pack I opened and then turnaround and use the money to fill a hole in my Phillies collection. Even within those confines, this one was a memorable one I’ll never harbor any regrets about.